We have published a series of Entries and Quick Facts that provide a comprehensive overview of Robert E. Lee’s 1863 Gettysburg Campaign. The series covers the events from June 9, 1863, with the Battle of Brandy Station, through the Battle of Gettysburg from July 1–3, 1863, and culminates with the Battle of Manassas Gap on July 23, 1863. After Chancellorsville, Lee decided to invade the North. He planned to disengage Union forces near Fredericksburg and move the Army of Northern Virginia northwest across the Blue Ridge Mountains. From there, he would push northeast through the Shenandoah Valley into Maryland and Pennsylvania. The turning point of the Civil War in the Eastern Theater came at Gettysburg on July 3, 1863. 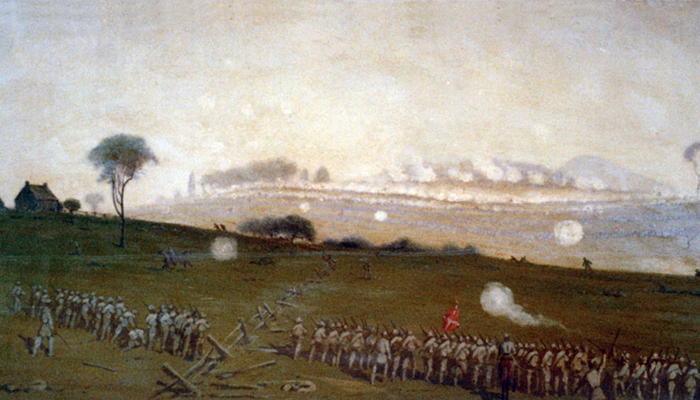 Lee ordered an ill-fated charge on Union positions on Cemetery Ridge. The Confederate charge was led by George Pickett, and the target was a small place on the ridge, which we know as The Angle, where a stone wall zigzags it’s way across the ridge. The wall ends near a group of trees known as the Copse of Trees, and in front of that is the High Water Mark of the Confederacy. A monument stands by those trees and marks where Pickett’s Charge was turned back, with devastating results. Lee’s Army would never recover. The Battle of Brandy Station, also known as the Battle of Fleetwood Hill, was fought June 9, 1863, in Culpeper County, Virginia. It was the largest cavalry engagement of the Civil War. The battle served as a morale booster for the battered Army of the Potomac by demonstrating the Union cavalry was beginning to emerge as a worthy opponent for their formerly, far-superior Confederate counterpart, led by J.E.B. Stuart. Check out our Summary of the Battle of Brandy Station. Get the Facts on the Battle of Brandy Station. Add the best books about the Battle of Brandy Station to your library. The Confederate victory at the Battle of Winchester II (June 13 – June 15, 1863) cleared the upper Shenandoah Valley of Union resistance, paving the way for Robert E. Lee’s invasion of Maryland and Pennsylvania. Confederate Lieutenant General Richard Ewell’s victory at enhanced his reputation in his first test as a corps commander following the death of Thomas “Stonewall” Jackson at the Battle of Chancellorsville. Check out our Summary of the Second Battle of Winchester. Get the Facts on the Second Battle of Winchester. Add the best books about the Second Battle of Winchester to your library. The Battle of Aldie was inconclusive. At the end of the day, Union Major General Alfred Pleasonton’s Cavalry Corps held the junction of Ashby’s Gap Turnpike and Snickersville Turnpike, but he had gained no significant information about Lee’s movements on the west side of the mountains. The battle cost the Union 305 dead and wounded compared to roughly 120 Confederate casualties. Particularly hard hit was the 1st Massachusetts Cavalry. Of the 294 troopers from that unit, 198 were killed or wounded. Check out our Summary of the Battle of Aldie. Get the Facts on the Battle of Aldie. Federal troops nearly captured Confederate Major General J.E.B. Stuart on the first day of the Battle of Middleburg. Check out our Summary of the Battle of Middleburg. Get the Facts on the Battle of Middleburg. Check out our Summary of the Battle of Upperville. Get the Facts on the Battle of Upperville. The Battle of Hanover delayed J.E.B. Stuart and his cavalry, and they arrived late to Gettysburg during the second day of the battle. Check out our Summary of the Battle of Hanover. Get the Facts on the Battle of Hanover. Add the best books about the Battle of Hanover to your library. 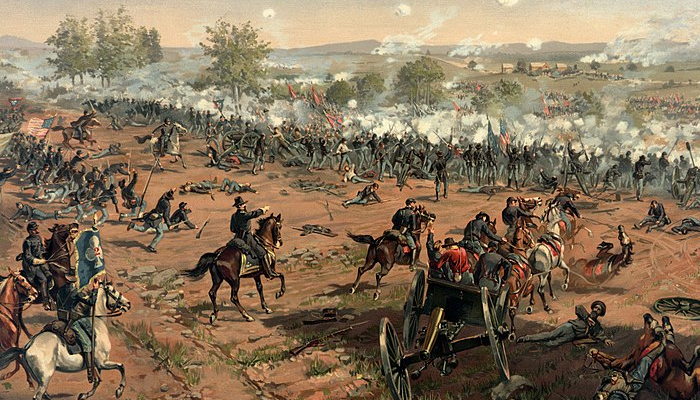 Check out our Summary of the Battle of Gettysburg. 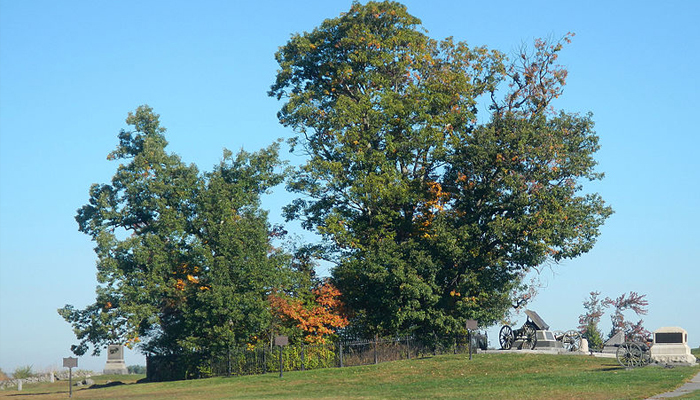 Get the Facts on the Battle of Gettysburg. Add the best books about the Battle of Gettysburg to your library. Get the Facts on the Battle of Williamsport. Check out our Summary of the Battle of Boonsboro. Get the Facts on the Battle of Boonsboro. Check out our Summary of the Battle of Manassas Gap. Get the Facts on the Battle of Manassas Gap.